Morgantown Personal Injury Attorney Terry Brian Tignor has been selected to the 2016 West Virginia Rising Stars list. Each year, no more than 2.5 percent of the lawyers in the state are selected by the research team at Super Lawyers to receive this honor. 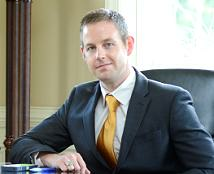 Mr. Tignor is an alumnus of West Virginia University, which he attended for both undergraduate studies and law school. After law school, Mr. Tignor added to his education and training by attending the National Trial Advocacy College at University of Virginia. Mr. Tignor is licensed to practice law in all levels of state and federal trial courts in West Virginia, as well as the Fourth Circuit Court of Appeals.